The Turquoise Valley Golf Course is located in Naco, AZ. These pictures were submitted by eastbayray. He writes: " Naco is a small town south of Bisbee right on the border with Mexico- indeed, if you hook a shot severely on the 6th hole you have an outside chance of seeing your ball bounce out of our country. 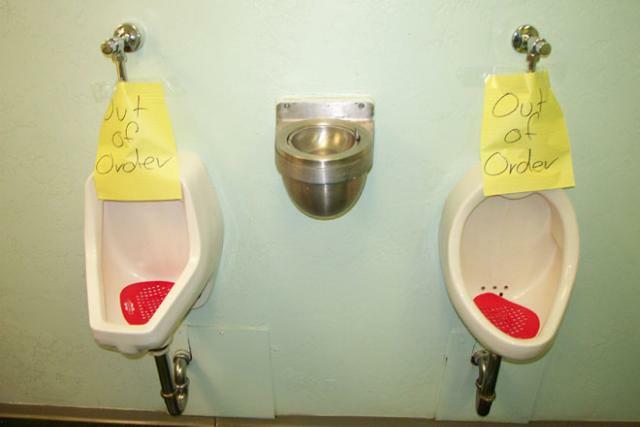 Note that it's a bad day for Urinals at Turquoise Valley, but smokers can still take advantage of the ashtray located between the installations."